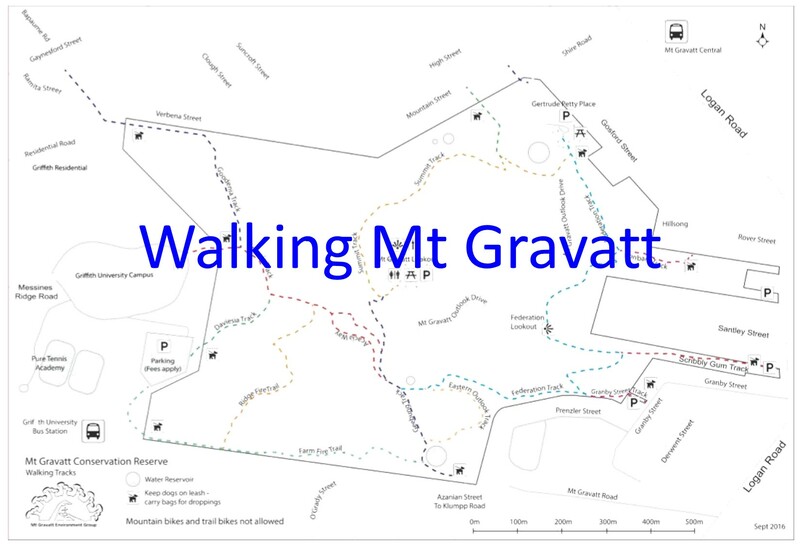 Mt Gravatt Bush Blokes has grown naturally out of the regular Fox Gully Tuesday Bushcare. Meet the Bush Blokes, an eclectic collection of blokes, who enjoy the peace of working in the bush and, of course, sharing tall stories. Conversation today ranged across fishing, the best way to cook the fish, a bit of politics, that our Scrub Turkeys are nothing to the scratching of Cassowarys that invade Dennis’ backyard in north Queensland and writing science fiction. Dennis, who is visiting his “little” brother Marshall, comes from Mourilyan Harbour near Innisfail. We are now sourcing volunteers from over 1,600 km away: not a bad reach! 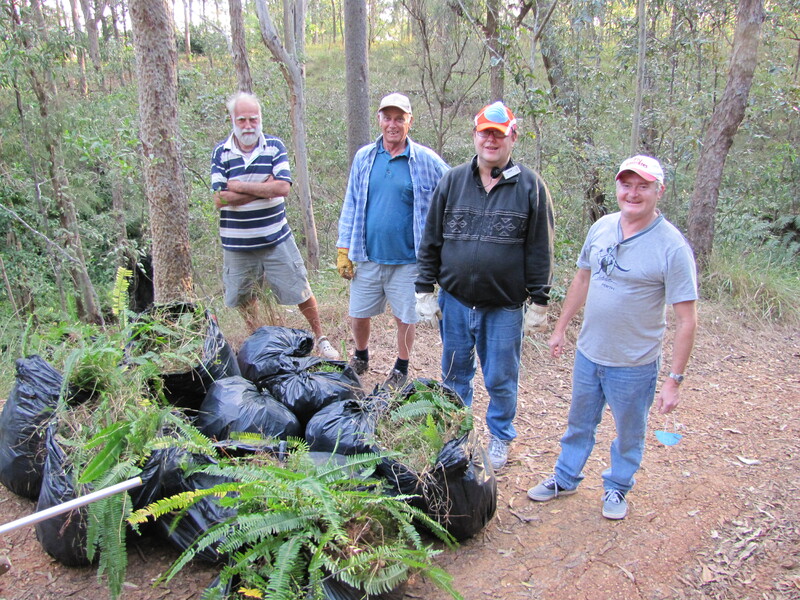 As well as supporting our Fox Gully Bushcare initiative, Marshal is restoring the bush on his property which forms part of the Firefly Gully wildlife corridor. Michael, our science fiction writer, and Paul, who shares his tall tales of working as a jockey in Japan, are community volunteers who just enjoy the time in the bush working with mates on a worthwhile project. Thirteen garbage bags of Fishbone Fern Nephrolepis cordifolia does not seem that much until you realise that every bag had to be carried up out of the gully, after standing on logs on the slope to clear the weed then scratch out the hundreds of water nodules and wiry roots that will re-shoot if left behind. Our Bush Blokes are proud of our achievements and particularly proud of the Brisbane’s Spotless Suburbs Partnership Award. 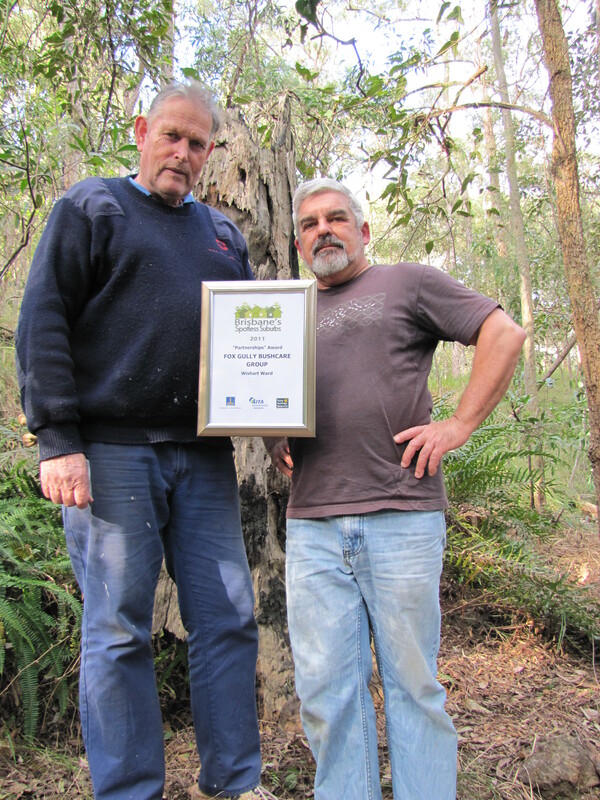 Steve, another Bush Bloke, and I posed with our award last week. 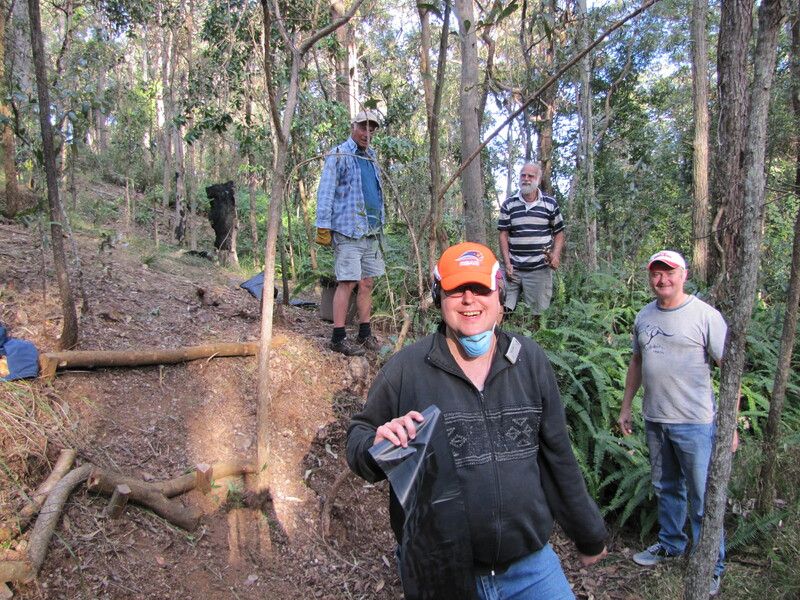 Steve is an ex-farmer, so learning the low impact natural regeneration bushcare approach was a bit of an adjustment. However I am constantly impressed by his amazing capacity to just quietly get the job done. Steve has cleared the major weed infestation at the corner of the maintenance track near the water reservoir and spread the thick layer of mulch to control weed regrowth and stop the water erosion. Mt Gravatt Bush Blokes is becoming a powerful team who are experts on weed removal and importantly native plants as I identify natives like Barbed Wire Vine Smilax australis: well named so we cut off close to the ground to make it safe and easy to work – this tough native re-shoots rapidly once the restoration team has finished the area.